June 27, 1999 Marion Motley, hall of fame football player, died. Motley was born June 5, 1920 in Leesburg, Georgia but raised in Canton, Ohio. After playing college football at South Carolina University and the University of Nevada, Motley joined the United States Navy and played for the Great Lakes Naval Training Station team. He started his professional career in 1946 with the Cleveland Browns in the All-American Football Conference. Led by Motley, Cleveland won every championship in the four year existence of the AAFC. When the AAFC shutdown in 1949, he was the league’s career rushing leader. 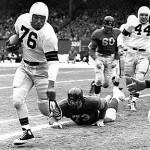 The Browns joined the NFL in 1950 and Motley led the league in rushing that year.